Eun Jeong actually got this tip from Korean TV. Everyone knows that common industrial soju is not the traditional rice whiskey that was its origin. From my gathering, it’s pure grain alcohol derived from sweet potatoes and tapioca that’s been diluted and artificially flavored with maybe a little of it coming from rice. One whiff of industrial soju, and–to me–it smells like a hospital. If you have some leftover soju around the house or just some you got from a well-meaning friend, don’t despair. 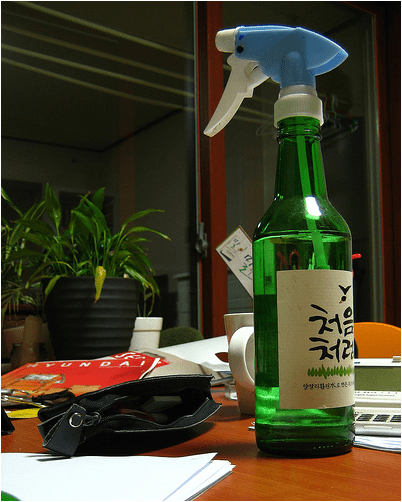 It’s funny that a spray nozzle fits perfectly on a soju bottle. We use it around the house as a cleaner. It’s pretty good at cleaning off grease from the stove. It’s not too bad as a window cleaner. It’s also good as a dry cleaner. Spray it on your smoke-ridden clothes, let dry, and much of the smell is gone. And you won’t smell like soju either. You just gotta make sure to wait until it’s dry. Also, this works only with industrial soju. The expensive Andong stuff–that’s for drinking. That’s your public service announcement for the day. If you have a tip you want to share, leave it in the comments or write us directly. Love this. I bought a bottle to add to my cooking, but don’t really use it too often. I can’t stand the smell, so I won’t drink it either. The part about using it to clean out smoke is genius. Thank you. Why would you use soju for anything other than eating/drinking? i use it as aftershave. no joke. A friend of mine makes skin toner by mixing Soju and lemon juice.